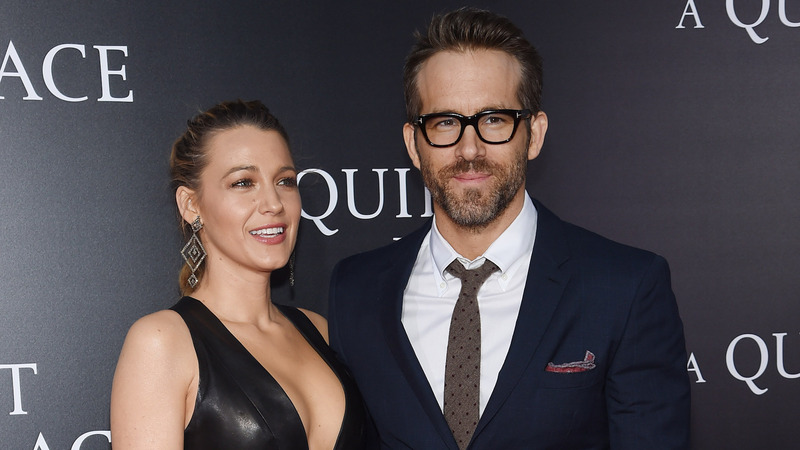 Since they got married in 2012, Ryan Reynolds and Blake Lively have never resisted an opportunity to troll one another, which possibly makes them one of the best couples in Hollywood. At San Diego Comic-Con 2018, Reynolds cracked a few jokes about their relationship during a Deadpool 2 panel, and honestly, we're just excited for Lively's response. These two never let the other have a leg up for long. Reynolds was in attendance at SDCC to promote Deadpool 2 and the film's supercut, which will be released on DVD and Blu-ray in August. According to his Twitter and Instagram, he spent the weekend doing panels, meeting fans and hanging out with his Deadpool family, but he also took some time to crack jokes and see the sights — including pretending to pinch a billboard of Nathan Fillion's head between his fingers for a photo. The truth of what he's been doing in Lively's absence from home came out after the divorce crack, according to Time. Reynolds admitted he's been doing what most of us do when our spouses are away: marathoning movies. “Do you ever do those where you watch like every Quentin Tarantino movie? So I’ve been kind of doing that,” he said. Time notes that Lively is currently filming the spy thriller The Rhythm Section in Ireland and Spain. She stars as protagonist/hero Stephanie Patrick; the film is an adaptation of the first book in a four-book series by Mark Burnell. It hits theaters February 2019, but Lively also stars alongside Anna Kendrick in A Simple Favor, which premieres in September.